Recently I hook'ed up a 12" afghan block that I decided to turn into a Crochet Butterfly Garden Octagon. I have used the same stitches from my afghan block but slightly changed up the pattern. I took pictures of the special stitches as I was working on my octagons. The special stitches from this pattern can also be used the Butterfly Garden Afghan Block. I'm still working on making my octagons and squares, I want to make an afghan, not sure on what size yet but it's in the works. This pattern is for the Crochet Butterfly Garden Octagon and Squares. Once I have made enough of each I will work at joining them and possibly adding a border, when I figure out how I am going to join it and finish off I will be sure to share what I did. If you're faster than me and are looking for a way to join your octagons and squares, check out this round up of ways to join available HERE. Crochet Butterfly Garden Octagon Pattern Notes..
sm cl st (Small Cluster) - yo, insert hook into st, yo, draw up a loop, yo, draw through 2 loops on hook, yo, insert hook into same st, yo, draw up a loop, yo, draw through 2 loops on hook, yo, draw through all 3 loops on hook. lg cl st (Large Cluster) - yo, insert hook into st, yo, draw up a loop, yo, draw through 2 loops on hook, (yo, insert hook into same st, yo, draw up a loop, yo, draw through 2 loops on hook) 2 times, yo, draw through all 4 loops on hook. Join to beg cl st..
sm cl v-st - (sm cl st, ch 1, sm cl st) in same st.
dc-pop-st - 4 dc in same st, on last stitch draw up a 1” loop, remove hook, insert hook into beg dc, attach loop onto hook and draw up a loop. hdc-pop-st - 4 hdc in same st, on last stitch draw up a 1” loop, remove hook, insert hook into beg hdc, attach loop onto hook and draw up a loop. Adding butterfly bodies & antenna..
Crochet Butterfly Garden Octagon Pattern..
Start with MC and a magic ring, ch 3 (counts as beg dc), dc in ring 11 times, tighten ring, join with sl st to beg dc, fasten off. (12 dc) Note: If you cannot work a magic ring, ch 4, work stitches in beg ch. For the square I used a US J10/6.00mm hook. Crochet Butterfly Garden Octagon Photos..
Crochet Butterfly Garden Octagon Video Tutorial..
To work the butterfly bodies please visit the video tutorial posted above. 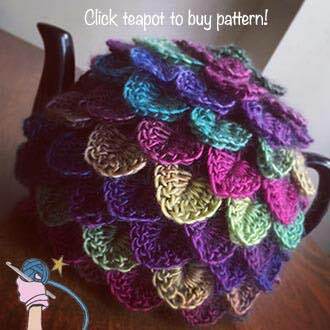 This pattern is free to view on my blog, a PDF of the pattern can be purchased on Ravelry..
Have you made your own Crochet Butterfly Garden Octagon? Please share your pictures on my Facebook WALL or 'hook up' your project on Ravelry. Thanks. I’m not sure what that means lol I’m Canadian. Love your work. I have an idea …..just for you.